I'm posting this one with a warning. You do have to pay for shipping. Newegg is offering about two dozen items throughout their store at discounted prices, but with the rebate they will be FREE. 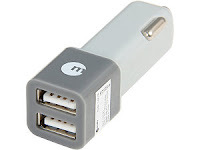 Headphones, cables, software, charging stations, and what I'm ordering - a macally White Dual USB Car Charger. So you order and pay for it, mail in the rebate form, and wait for the check to arrive. No, there aren't laptops of TVs here, but don't look a gift horse in the mouth (I still don't know what that means). Click here to view the full list of FREE after-rebate offers at Newegg.com.